The Horseman 3D, Non-Digital Photographic Expensiveness | OhGizmo! If some of y’all out there are still dealing in the arcane world of the non-digital photography, perhaps this next item might tickle your fancy. It’s the Komamura Horseman 3D, and its claim to fame (and outrageous pricetag) is that it can take 3D pictures. Now, we’re talking red/blue, special glasses sort of three dimensions, so don’t get too excited. Of course, this is not the first camera to accomplish this feat, but apparently this one comes with two 38mm f/2.8 Fujinon lenses which share a single shutter. This, along with some marketing hoopla, seems to be enough to convince the company that it’s a good idea to charge a rumored $5,000 for it. It’s not exactly out yet, though it’s expected sometime this summer. I dub this camera “Oinker”! Ever want to spend $5,000 to be able to use an ancient technology to create an effect that hasn’t been cool for 10 years? This will do it. 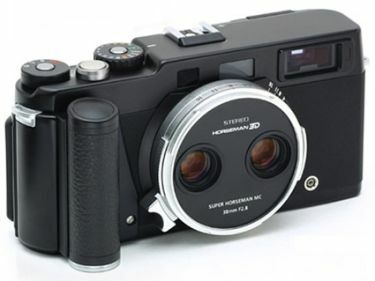 The Horseman 3D is a non-digital camera that will create 3D images……. You fucken idiot, It wont shoot photos in red/blue thats just for a sample. You can still find 3D kodak cameras on ebay, along with some by other ’50s companies as well. They use 35 mm film, and work quite nicely. I’m not sure what the current price range is, but I got one in good shape for US$70. I don’t get it how no modern digital 3D cam wasn’t released yet. This is easy to build and should cost no more than a few hundreds. Too bad. I’m taking plenty of 3D photgraphs myself, but I have to reply on manual shifting which takes much care and training. Pitty. There is an easy digital solution to make 3D images: Loreo lens in a cap. You use a lens on your Canon 300D (or Rebel) that makes two images. These two images can be viewed as 3D with special glasses or with well trained eyes.